Sometimes a payor includes multiple claims on an explanation of benefits (EOB) and sends you one payment to cover those claims. 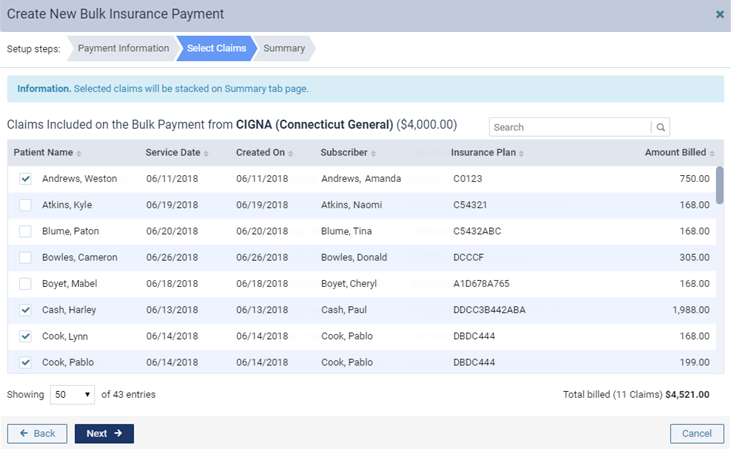 You can split an insurance payment between multiple claims by entering a bulk insurance payment and then applying part of that payment to each claim without having to open each patient's record individually to post a payment. You can create bulk insurance payments according to your security rights for the Ledger. The creation of a bulk insurance payment appears in the audit log. Click (or tap) Create New Bulk Payment. The Create New Bulk Insurance Payment dialog box appears. Carrier name - The carrier that the payment is coming from. Begin typing the name of the carrier that the payment is from, continue typing to narrow the results list as needed, and then select the correct carrier. Payment type - Whether the payment is from a check or an EFT. On the Select Claims tab, select the check boxes of the claims that this payment applies to. 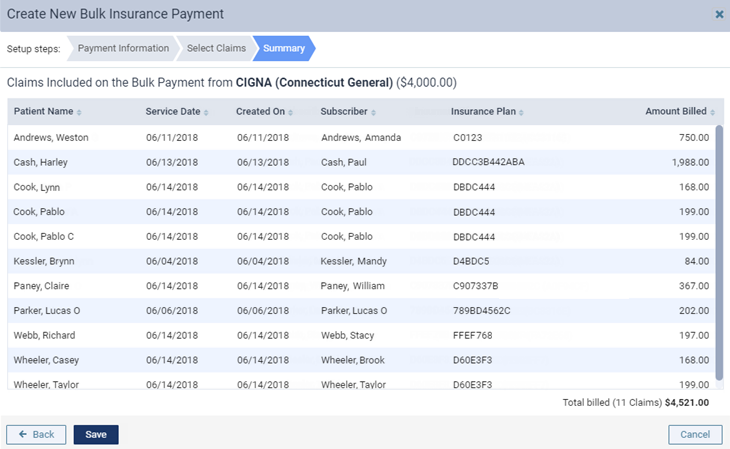 For each claim, the patient name, date of service, subscriber, plan name, and amount billed appear for your reference to help you identify the correct claims. 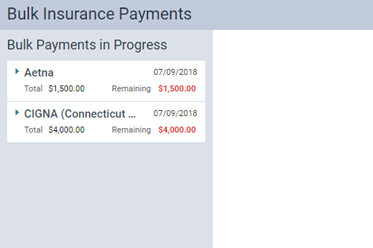 The new payment appears on the Bulk Payments in Progress panel of the Bulk Insurance Payments page. You can now apply portions of the payment to the selected claims.